The scheme to electrify the Manchester Sheffield and Wath line using overhead 1500V DC was announced in November 1936. The 1500V system had been recommended by the Ministry of Transport in 1927, and was already in use on the Manchester, South Junction & Altrincham line (MSJ&A). The initial proposal included 69 mixed traffic (Class EM1), 9 express passenger (Class EM2), and 10 banking (Class EB1) locomotives. The mixed traffic EM1 design was started first, and tenders were invited at the end of 1937. In January 1939, electrical equipment for 70 locomotives was ordered from Metropolitan Vickers Electrical Co. with final assembly to take place at Doncaster Works. The electrification scheme was halted due to World War 2, and the initial order was reduced to one prototype in November 1939. Contemporary accounts note that the EM1 had an unusual design. The two 4-wheel bogies were linked by a coupling. The drawgear and buffers were mounted on the outer ends of the bogies, resulting in no transmission of traction or braking forces through the locomotive body. A similar system with the drawbar through the bogies had already been supplied by Metropolitan Vickers to South African Railways. Gresley was interested in the mechanical design of the new locomotives, and visited both South African Railway and Metropolitan Vickers. Gresley was reportedly very impressed with the system after these visits, and adopted it for the new locomotives. Each axle was driven by a 467hp motor through 17:70 reduction gear. The two motors on a bogie were connected in series, so that they received 750V DC. The two bogies could then be controlled in series or parallel. An EM1 would be started with the bogies wired in series. Acceleration was achieved by successively switching out the fifteen starting resistances. Further speed could be achieved by switching from series to parallel, and returning the resistances back into the circuit. In addition to the fifteen resistances, an extra control could be applied by diverting the traction motors' field current through another resistance. This allowed for a total of 19 'notch' settings and two 'gears' (series/parallel). The choice of a Bo+Bo (4 wheel axle) wheel arrangement was primarily due to the LNER's concerns regarding the capital cost of the project. This quickly proved to be a serious mistake due to excessive weight transfer when accelerating. When starting from a stop, it was possible for the reduction in the load on the leading axle to result in wheel slip and a loss of adhesion. In an attempt to compensate for the loss of adhesion on these axles, a 'weight transfer switch' could reduce the field current in the leading motors on each bogie, but this proved ineffective in operation. As well as reducing the weight transfer problem, a heavier Co+Co locomotive would have also helped with braking on the long descents found on the Woodhead route. Prototype No. 6701 was completed in August 1940. Initial trials involved towing No. 6701 with a steam locomotive on the East Coast main line between Doncaster and Retford. These trials found an extremely uncomfortable natural period of oscillation at around 20mph. Various alternative spring arrangements were tried until better riding conditions were obtained. No. 6701 was then officially added to stock in September 1941 and worked electrical trials on the MSJ&A. These trials typically included loaded wagons or empty coaches. For regenerative brake tests on the level, a gradient was simulated by attaching two J39 0-6-0s which worked full-out in the opposite direction. The MSJ&A trials tested the electrical equipment but found further ride problems at about 20-25mph. No. 6701 returned to Doncaster on 14th October 1941, and entered storage until after the war. No. 6701 came out of storage in 1947, and was renumbered as No. 6000. Its suspension gear was altered, maintained, and thoroughly cleaned; resulting in improved riding during further trials on the East Coast main line. No. 6000 was then shipped to the Netherlands State Railway in September 1947, and was running by the 15th. By November 1947, No. 6000 had clocked up 10,000 miles but the ride quality was already beginning to deteriorate again. Various alterations were tried, and a satisfactory solution was only reached in March 1948 when drastic changes were made to the bogies, upper-structure springing, and the bogie coupling. These changes were very successful, and were still in place when No. 6000 returned to Britain in February 1952. On its return, No. 6000 was officially named Tommy - an affectionate name that the Dutch had used for it, in reference to their recent experiences with British liberation forces. Authority was given to build the production EM1 locomotives in July 1946, but the order was not placed until after Nationalisation. Twenty four were ordered from Darlington in January 1948, and fifty seven were ordered from Gorton in July 1948. The Darlington order was later cancelled, but the Gorton engines entered service between October 1950 and August 1953. Mechanical parts and final completion was performed at Gorton, but the electrical equipment and traction motors were fitted at Dukinfield. The most obvious external changes were the cab door and side window positions. The production locomotives used the modified spring and bogie arrangement adopted in the Netherlands. The last ten EM1s were also fitted with Timken roller bearing axleboxes, in place of plain white metal bearings. Nine of the production EM1s were fitted with Bastian & Allen steam generators to heat passenger trains. Five more were fitted with steam generators in 1955. Each boiler had three heating circuits that were automatically switched off at 61, 63, and 65 psi. Each circuit consisted of sixty quartz-covered 2KW heating elements. This gave a total rating of 360 KW and a steaming rate of 1,000lb/hr. The boilers were taken out of use over time. Unused boilers tended to be left in situ due to the need to replace them with a balance weight. The boilers were also known to occasionally work loose and become a hazard, so some were eventually removed. A number of EM1s were scrapped with their boilers intact. Before June 1951, running-in trials were performed on the newly-opened 1500V Liverpool Street to Shenfield line. The overhead wires were energised in the Wath area in June 1951, and both trials and crew training moved to the Wath shed. Production EM1 locomotives entered full service in February 1952, operating the Wath to Dunford Bridge stretch. Trains were operated by two locomotives - one hauling, and one banking. Weight transfer on the Bo+Bo wheel arrangement led to severe slippage on the leading axles, and train loads had to be reduced from 850 tones to 750 tons. The weight transfer problem also led to some of the bogie centre pins being bent or fracturing. A series of trials between November 1952 and January 1953 attempted to find a cure for these problems. The trials used the London Midland Region and Eastern Region dynamometer cars, and attempted to quantify the forces involved and attainable factors of adhesion. A maximum load of 13.6 tons was measured on the bogie pin. Laboratory tests found that this load resulted in a stress of 10.3 tons / sq.in. on the hollow steel bogie pins then being used. A forged steel pin would reduce the stress to 4.5 tons / sq.in, and these were quickly adopted as standard on the EM1s. Weight transfer could also be reduced by slowly switching out the starting resistances. Normally, the starting resistances are switched out of circuit quickly so that they did not overheat. Slipping was found to be much less likely if the starting current was not allowed to exceed 660 amps. Although this could result in the starting resistances getting quite hot, no damage was detectable. It was assumed that the original design instructions included a large safety margin. The new Woodhead tunnel opened shortly afterwards on 3rd June 1954. Further trials in early 1955 confirmed that the EM1s met their contract specifications, and that they were ideal for freight operations. Cab riding was poor over 50mph but none of the test freight trains exceeded 43mph. The EM1s were fitted with two pantographs. The original plan was to only use the rear pantograph, and keep the front one incase of damage. The Woodhead route was plagued by serious ice problems, soot from steam engines, and unusual atmospheric conditions; all of which contributed to poor and often intermittent pickup from the overhead line. This experience quickly led to the use of both pantographs simultaneously. This greatly improved the pickup and is thought to have also significantly lengthened the life of the overhead wire. No. 6701 was initially known as "0-4+4-0 Mixed Traffic" when it was built. The designation of Class EM1 was introduced in September 1945. 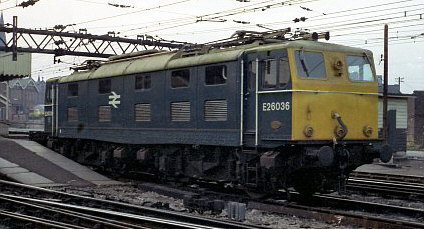 British Railways gave them EM1 engines the classification of Class 76 in 1968. In 1974, suffix letters were added to identify four variants. "76-aV" referred to the basic EM1 design with no heating boiler but with a vacuum brake. "76-bX" referred to EM1s fitted with dual brakes. "76-cV" referred to the basic design with a heating boiler and vacuum brake. "76-dA" referred to locomotives with the air brake modification. The EM1s primarily hauled coal over the Woodhead route. All of the EM1s were officially allocated to Reddish depot, but they were usually distributed to depots along the route as required. The EM1 locomotives proved adequate for passenger services between Sheffield and Manchester, and they took charge of this traffic after the EM2s were withdrawn in 1968. The official end of passenger services in January 1970 led to the first two withdrawals in March 1970. These were Nos. 26035 & 26042 which sustained damage to their high voltage compartments and had been in storage since 1968. In reality, a one-way EM1-hauled passenger service from Manchester to Penistone continued for a couple of years after this date, in the form of a newspaper train. During the 1970s, the Woodhead route became a freight-only route and the EM1s (now Class 76s) hauled numerous merry-go-round coal services from the Yorkshire coal field to Fiddlers Ferry power station near Warrington. In 1966-70 and 1973-7, thirty Class 76s were modified to allow for multiple workings and air-braking on the heavy merry-go-round trains. As gradual withdrawals progressed during the 1970s, Timken-fitted bogies from withdrawn locomotives tended to be re-used on earlier locomotives during overhauls. By August 1979, thirty eight Class 76s remained in service. Declining coal traffic took its toll on the last surviving overhead 1500V DC line, and the Woodhead route's days were numbered. The Woodhead route eventually closed to all traffic on 18th July 1981, and all thirty four remaining Class 76 locomotives were withdrawn. Note: The length over buffers dimension was slightly larger with BR standard drawgear (50ft 6in) or articulated three-link couplings (50ft 7.5in). Weight and axle loadings are for the dual brake (76-bX) variant. All variants weighed between 86 tons 14 cwt and with 87 tons 18cwt with the exception of No. 6000 (89 tons 0cwt). No. 26020 (later 76 020) is the only complete EM1 to have been preserved, and is a part of the National Collection. A cab section from No. 76039 (No. 26048 Hector) has been preserved in the Manchester Museum of Science and Industry. MSL Hobbies Ltd produce nickel silver etch kits of the EM1 (Class 76) for 2mm (N gauge), 4mm (OO gauge), and 7mm (O gauge) scales. The 2mm kit requires a modified KATO chassis. DC Kits and Q Kits have both produced 4mm (OO gauge) kits of the EM1, but current availability is unknown. A ready to run OO model of the Class 76 has been produced exlucsively by Heljan for Olivia's Trains. The final twelve EM1 engines received Greek names. The prototype, also received the name Tommy whilst on loan to the Netherlands, and retained its name when it returned. Tommy's nameplate was inscribed "So named by drivers of the Netherlands State Railways to whom this locomotive was loaned 1947-52". Tommy originally bore the LNER number of 6701 and was renumbered in 1946 to No. 6000. All nameplates were removed from the EM1s 1968-70. Thanks to Mike Bennett for the "BR Blue Era" photograph of Class 76 No. 76022 at Reddish. Thank you to Mike Morant for the colour photograph of EM1 No. E26036 in BR blue.